The Bombay, named for the city of Bombay (now Mumbai) in India because it was bred to look like India’s leopards, has glossy black fur and large copper or golden eyes. 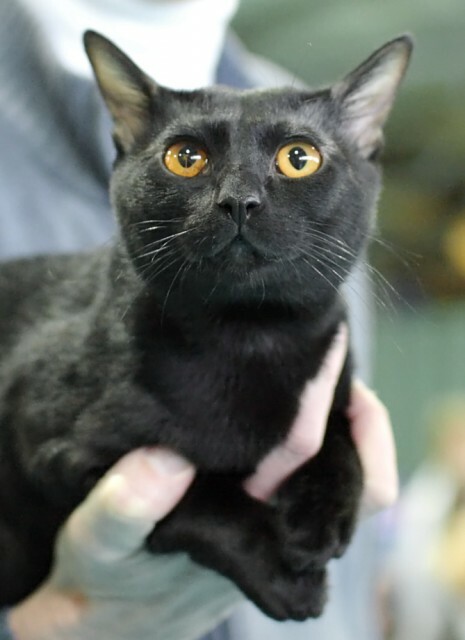 The Bombay was created by Nikki Horner, who crossbred sable (dark brown) Burmese and black American Shorthair cats to create domestic felines that looked like little panthers. Although some Burmese breeders opposed Horner’s breeding program, the Bombay was accepted by the Cat Fanciers’ Association in 1970. Bombays are medium-sized, muscular cats, heavy for their size, with short, satiny black coats. Adult males usually weigh about 8-11 pounds and females 6-9. Bombays have round heads, full faces, wide-set ears with rounded tips, and round wide-spaced eyes. Although the preferred eye colour is that of new pennies, many Bombays have golden eyes rather than copper, and eye colour may change over time. In particular, the eyes of males may fade or even turn green sometime between 3 and 5 years of age. As with many other purebreds, there is a Traditional and a Contemporary head style, with the Traditional having a longer, narrower muzzle and the Contemporary (Extreme) type having a flatter face and shorter muzzle. These days, Bombays are rarely outcrossed with American Shorthairs, However, they are still frequently outcrossed with Burmese cats, and occasionally this may result in a sable-coloured kitten. Sable Bombays are sold as pets, because they can’t be classified and shown as Bombays, although the International Cat Association (TICA) allows them to be shown as sable Burmese. The Bombay represents the best of both worlds, manifesting the playfulness and intelligence of the Burmese and the pleasant, easy-going temperament of the American Shorthair. Many owners assert that Bombays can learn to do tricks and that many take to leash walking if properly trained. The Bombay tends to be calm and accepting of other pets (including dogs), though it usually has a need to be the dominant animal. Friendly and people-oriented, Bombays are known for greeting visitors at the door. The Bombay is rarely aloof or independent. Rather, like its Burmese cousin, it is known as a “Velcro kitty” that will stick by its owner’s side as much as possible. Bombays need a lot of attention and affection and are not good choices for those who spend much of their time away from home. They are excellent family cats, with owners noting that they are particularly good with children. Bombays tend to bond with entire families rather than favouring one individual, and many are lap cats. Talkativeness varies from one Bombay to the next, with some being very chatty and others quiet by nature. When they do vocalize, their voices are distinctive, though not as loud as that of the Siamese. Some Bombays suffer from the same health issues that can afflict the Burmese, including runny eyes and breathing and sinus problems. Choosing a Bombay with the Traditional face type rather than the Contemporary type reduces the likelihood of problems, as does adopting from a legitimate breeder. Like the Burmese, a Bombay kitten will occasionally be born with a severely deformed head, requiring euthanasia at birth. The Bombay is a fast-maturing breed. Although full muscular development in males may not be complete until 2 years of age, some males sire litters when they are just 5 months old. Bombay cats tend to have big appetites. Food has to be regulated in some cases to prevent excessive weight gain. Bombays are still relatively rare and expensive, and there are only a small number of breeders worldwide, with the majority producing few kittens each year. Even a pet quality Bombay kitten costs $300-$600 on average, and show quality kittens are priced between $750 and $2,000, depending on bloodlines, gender, and other factors. Demand for Bombay kittens is high, and most breeders maintain waiting lists. Adult Bombay cats can sometimes be purchased from breeders for $100 to $200 once they have been retired from breeding. They can also be adopted from shelters and rescue organizations. See the Bombay Cat Rescue page and Petfinder’s list of adoptable Bombay cats for available Bombays. Carlisle, J.M. (with modifications by s. Hauck), Cat Fanciers’ Association. (11 June 2009). “Breed Profile: Bombay.” CFAinc.org. P&G Pet Care. (2009). “Bombay.” Iams.com. Thomas, D. (1995). “The Bombay: Cat Breed FAQ.” Fanciers.com.